As part of analysing social interaction, conversation analysts use the transcribing convention developed by Gail Jefferson (see Jefferson, 2004). The Jeffersonian transcribing convention continues to be the main tool used for doing conversation analysis. The method is perfectly adequate for studying interaction that is only concerned with talk (e.g., telephone conversation). However, researchers who analyse face-to-face interactions (using video recordings) are also interested in how other embodied features such as gesture, eye gaze, and the use of objects are an important part of the interactional assemblage (for example Goodwin, 1981; Heath, 1986; Heath, 2013). Interaction scholars have come up with various ways of handling other embodied features besides talk. These include using an additional set of transcription symbols (e.g., Mondada, 2014), and incorporating sequences of still images either separately or interpolated with the transcript (e.g., Llewellyn and Burrow, 2008). Each of these solutions manage to preserve the temporality of action, which is a key feature of the CA transcript. As Laurier (2014) has discussed, however, a significant burden is placed on the reader to make sense of how these additional features occur in relation to the timing of the talk. 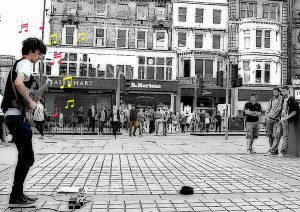 My dilemma was to investigate how I could present an analysis of the different kinds of street performance, where only relying on conventional transcription practices used in conversation analytic transcript was, for various reasons, not entirely satisfactory. The comic form, with its ability to show and tell in a combination of word and image, potentially offered a solution. Although, a way of preserving the temporality of action would have to be worked out. For example, with regard to some of the circle show interactions I analysed, the performers treated the precise occurrence of applause as an interactionally relevant matter. 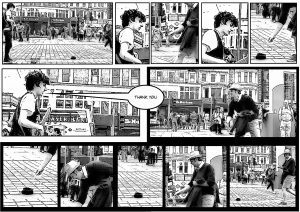 Therefore, I have conducted a series of ‘comic experiments’ in which I attempt to work through a few different problems of presenting an analysis of street performing interactions. Click the images below to learn about my adventures with comics.